Just my thoughts..: A Taste of what I read daily! A Taste of what I read daily! I read a lot on a daily basis. I regret not having the conviction to read books. I try to make up for it by reading blogs, news posts, forums etc. They are of course no substitute for a good book, but if you do neither, then you really are wasting all the facilities you have been provided with. Anyway, I would like to share with you a few things that I came across today. 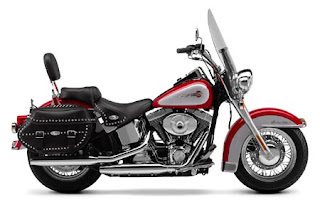 Twelve Harley Davidson bikes were released in Delhi recently and I saw a post on a blog about one of those bikes. Its called the FLSTC Heritage Softail Classic and it costs 20 Lakhs. The bike weighs 335kg and it has a 1450cc engine. On top of all this, the bike is a proper classic looking beast. Scott Berkun's is one of the few blogs that I follow. He is a writer. Though I haven't read his books, I love to read his blog posts. He posts regularly and his posts are usually just one paragraph or two. But this time, he posted a speech that he had just made in an event about Innovation. If you are even slightly interested in a good thought-provoking speech, do read this. Here is a small extract, to give you a taste - Ideas are easy. They are cheap. Any creativity book or course will help you find more ideas. What’s rare is the willingness to bet your reputation, career, or finances on your ideas. To commit fully to pursuing them. I'm sure that was pretty self-explanatory.. Its looks impressive! Most of my friends complain that they are bored at home and that they have nothing to do. Well, this may not solve your problem but its a good start. Reading something new about something that you are interested is both fun and useful. I'm interested in computers, bikes etc. and so, these were interesting to me. I'm sure you too can find something out there in the World Wide Web that interests you, regardless of how crazy or insane you may be. Just surf the wave! The Special Something of a Team! Changes in the Design of my Site!